2014 was quite literally the year of excellence for Mercedes-Benz in India. They introduced ten new cars and total sales by the end of the year crossed the 10,000 mark, their highest ever in India. It's 2015 now and as we begin to slowly get back to work, there's a new Mercedes already waiting to be driven. Meet the CLA-Class, the latest entry luxury sedan from Stuttgart that is going to be the first new launch for the German manufacturer this year. The CLA is easily one of the most striking vehicles on the road today. It's beautifully sculpted and makes full use of the new Mercedes-Benz design language. The car commands attention and in our opinion, should be opted for in the attractive bright red hue seen here. It's a familiar design - we have seen it earlier in the A-Class and the recently launched CLA. So this car too is an attention magnet. The front end is dominated by the same diamond radiator grille seen in the A but instead of silver dots, this car features gloss black elements. The headlamps feature bi-xenon lighting and neatly arranged LED daytime running lamps. The front bumper does look less dynamic but that's because we have already starting comparing the car to its AMG sibling. However the bulge on the bonnet is very much there and adds to the powerful presence. Move to the side and the coupe like roofline catches the eye. It even features frameless doors. Look closely and you'll realise that the car has increased ride height for India. While a lower height would have gone well with the car's silhouette, the increased clearance does help, especially on Indian roads. The wheelbase is longer than the A3, its closest rival. The five-spoke 17-inch alloys go well with the car's design and are finished in metallic grey with cut out metal highlights. The CLA's rear is a stunner too, the CLS inspired design being most evident here. 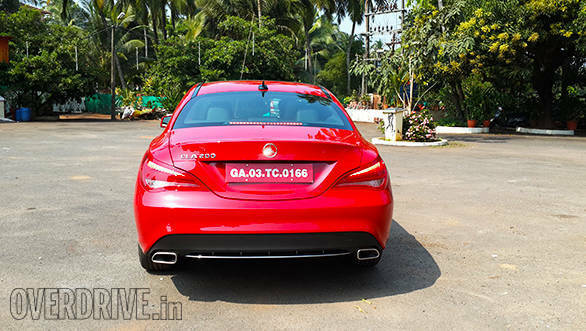 Like in the AMG variant, the LED tail lamps are very attractive, especially the light signature when the sun goes down. The car's styling is definitely its biggest USP. Step inside and you'll be greeted by a familiar interior. The A-Class dash has been carried over so you get the same sporty and smart cabin. There's either a dual-tone or all-black interior, depending on the exterior shade. We personally like the latter but the beige/black combo will appeal to a lot of buyers too. The textured aluminium finish division strip adds to the premium feel and is finished quite well. The upper section of the dash is covered with a soft touch material while the rest of the car uses hard plastic. The propellor style air vents are unique and can be closed by simple turning motion. 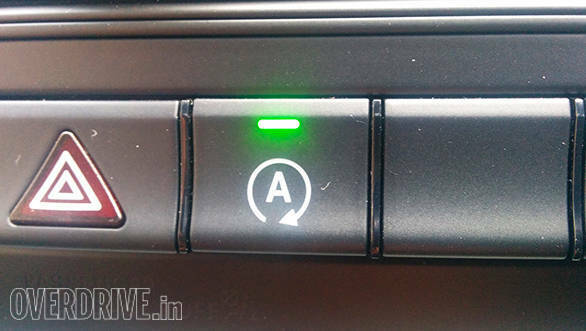 The tablet inspired infotainment screen is placed in the centre and cannot be folded or pushed away inside. The screen, however, is the largest we've seen so far among all the Mercedes MFA cars. It even features the latest fifth generation software , so you get a cleaner and better looking interface as well as added options like a an internet browser and radio to name a few. 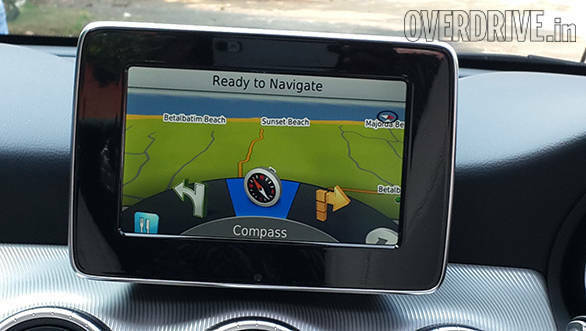 A new navigation system also debuts in the CLA - one doesn't have to load maps anymore from a CD, an SD card instead holds all data. Both the front and rear seats use fixed headrests and mimic a racecar seat design. It is quite comfortable too and offers good support. But what about rear cabin space? Well, there's good news - knee-room is sufficient, the long wheelbase certainly aiding that along with the sculpted front seats. The rear seats are good for two passengers thanks to the high transmission tunnel and seat design. Head-room takes a hit due to the sloping roof and could have been better. There is a rear AC vent but only in the diesel variant, strange. A rear armrest with cup-holders though is standard on both cars. The rear seats even split fold 60/40, boot space is impressive,there's 470 litres on offer but then the space saver eats up quite a bit of that figure. 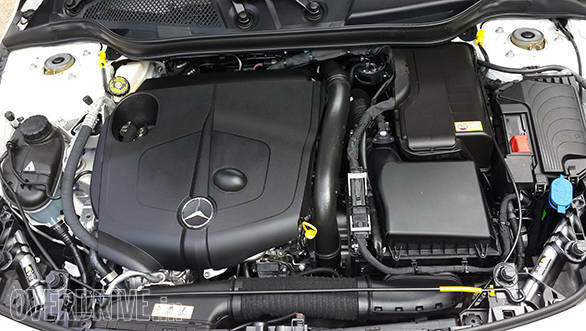 The CLA is offered in both petrol and diesel variants, the familiar 2.1-litre diesel producing 135PS from 3,600rpm to 4,400rpm and peak torque of 300Nm from 1,600rpm to 3,000rpm. 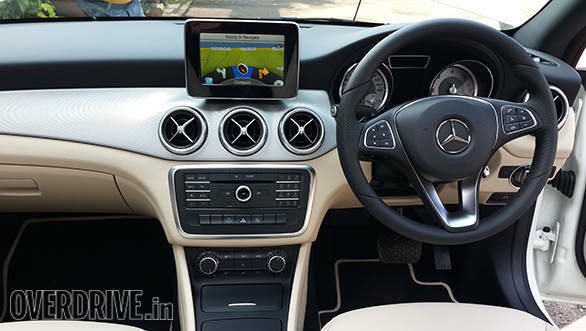 The car hits 100kmph in a claimed 9.8 seconds and can reach a top whack of 220kmph, according to Mercedes. Claimed overall efficiency is an impressive 17.9kmpl. The motor isn't very responsive despite minimal turbo lag and it is better suited for the highway. Cruising at triple digit speeds is effortless, the engine is hardly strained making it a nice tourer. The engine is also quite noisy, especially when compared to competition. Both the engines are mated to the 7-speed dual-clutch transmission seen in other MFA cars with three driving modes, Economy, Sport and Manual. The standard paddle shifters are a welcome feature and keeps the driver involved. We also drove the petrol variant - the good news is that the car won't feature the smaller 1.6-litre engine seen in the A-Class but the more powerful 2.0-litre turbocharged unit. The motor puts out close to 184PS at 5,500rpm and an equally impressive 300Nm of torque from as low as 1,200rpm. It is refined and there's hardly any turbo lag - it's the transmission that is slightly slow to rouse but once on the move, power comes in effortlessly. In fact, the car is claimed to reach 100kmph from standstill in a quick 7.8 seconds and max out at 235kmph, very impressive. 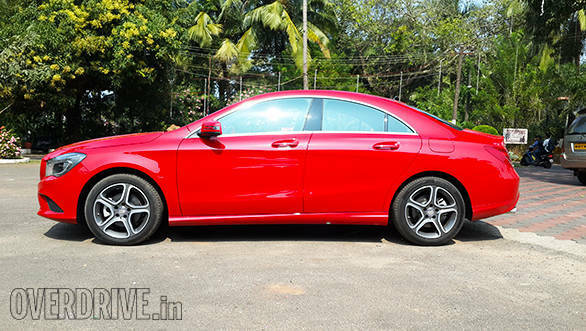 As mentioned before, the CLA for India gets increased ride height. This has helped improve ride quality by a margin compared to the A-Class and exceeds our expectations. Mercedes engineers have spent a good amount of a time tuning the car for India and it clearly shows. The car crosses high speed breakers without any contact with the road and drives through small potholes and broken surfaces without much complaint. It still isn't comparable to say, the C- Class. Power is transferred to the road through the front wheels so while there is a hint of understeer as well as torque steer, it still is a capable handler. The car holds its line, is well balanced, turns nicely into corners too and is happy even during quick direction changes. The steering offers good feedback and is not too light or heavy - it feels perfectly weighted. 225-section tubeless radial tyres are offered standard but since the media cars used various brands, we aren't sure which ones will make it to the final launch model. The CLA will be initially offered as a CBU so there will be only one top-end variant available. The car therefore features a host of safety and comfort features. Attention assist, tyre pressure monitoring and rain sensors are offered as standard. The car also gets ESP, ASR and hill start assist. Six airbags are offered including adaptive airbags for driver and passenger. Comfort features such as electrically adjustable front seats, a panoramic sunroof and a premium Harman Kardon stereo is also part of standard equipment. The CLA is a stunner both inside and out, drives well and is feature loaded too. It's been quite a wait but now that it's finally here, the only question that remains is how much will the car be priced at? 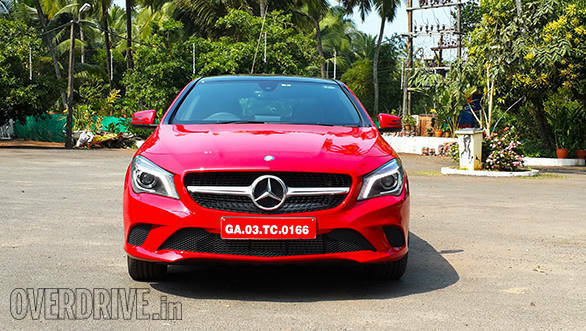 We expect Mercedes-Benz to price the car between the A-Class and C-Class, which means an ex-showroom Mumbai price of Rs 30 to 32 lakh. 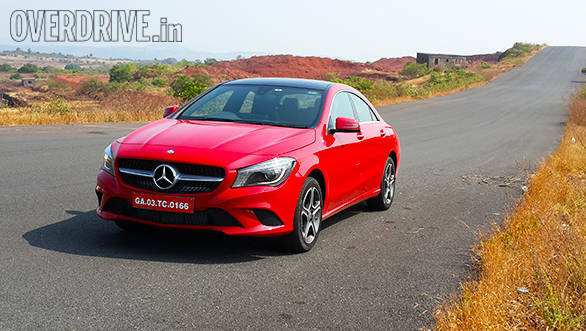 At this price, the CLA will be the most affordable Merc sedan and has the potential to become yet another star for Mercedes-Benz.